Afghan farmers harvest opium sap from a poppy field at Gereshk in Helmand Province. Photo: Noor Mohammad / AFP / Getty Images. Opium poppy production is at an all-time high in Afghanistan, increasing 87% — from 4,800 to 9,000 tons — over the past year, according to a U.S. government report. This is providing a crucial revenue stream for the Taliban, which has been gaining territory in the 16th year since the U.S. invasion. Why it matters: Seth Jones, the director of the Transnational Threats Project at CSIS, tells Axios that opium is "the single most important revenue for the Taliban." According to a new BBC report, the Taliban is now operating in 70% of Afghanistan — in full control of 14 districts and maintaining "an active and openly physical presence" in 66% of the country. 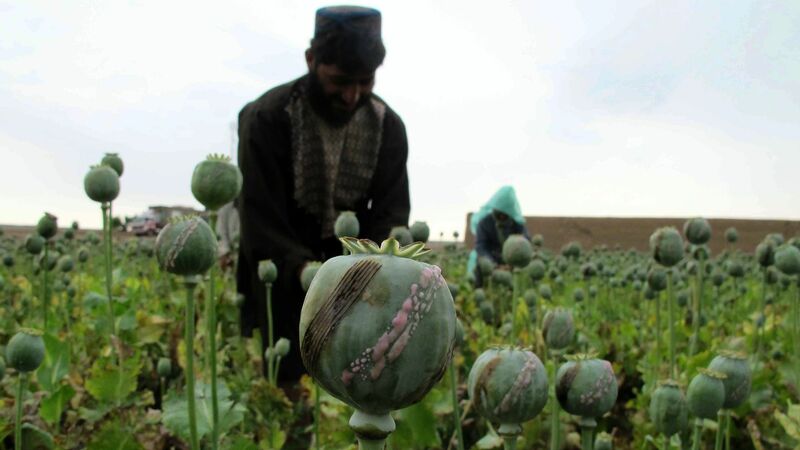 The 2017 Afghanistan Opium Survey from the United Nations Office on Drugs and Crime states that poppy cultivation now covers 320,000 hectares, an area about the size of Rhode Island. "U.S.-led efforts to design alternative livelihood programs for Afghan farmers have failed because they haven't been able to come up with anything more profitable." The spike in production has led to an increase in labs being built around the country, Jones says. The drug is more frequently being processed in Afghanistan, and while it's being sold to neighboring countries, it has also left the country with a growing drug addiction problem. The U.S. has been targeting drug labs in Afghanistan, the SIGAR report reveals, destroying 25 labs in November and December. But, but, but: The labs are easy to replace, the report states, typically taking around three or four days to re-build. Jones tells Axios: "The Taliban is...an insurgent group, but it's also a drug cartel. Drug revenue accounts for about half of the Taliban's total financing."